The #1 jersey at Michigan has become something of an enigma the last few years. It exists, but it also doesn't. My Tweet from Saturday's post-game presser illustrates what has begun yet another discussion of who could/should wear the #1 jersey. Frank Beckmann asked Hoke about the #1 jersey this year. Says he'll consider it. Says all 115 guys on the team are possibilities. The Braylon Edwards Foundation endows a $500,000 scholarship fund for the wide receiver who wears numero uno at Michigan. And don't get me wrong, I think that's great that he's giving back. Braylon has always been quite charitable since going pro. The problem is, because of Edwards' scholarship, he now represents that number, and has seemingly complete control over who gets it. The whole mess pretty much began when Rich Rod gave the number, unknowingly of said protocol, to a defensive back in his first spring on the job in 08. When word of this got back to Braylon, he was none too pleased. Thus began a tiff between Edwards and Rich Rod – which then just added fuel to the fire between Rich Rod and the Michigan Football establishment. So, Rich just put the #1 jersey discussion aside and moved on – in an attempt to diffuse the situation. But what it did was create even more intrigue about the #1 jersey, at least in the media. But Rich was never going to give in and hand out that number. So when Brady Hoke arrived, discussion of the number was seemingly back on. But then something interesting happened. 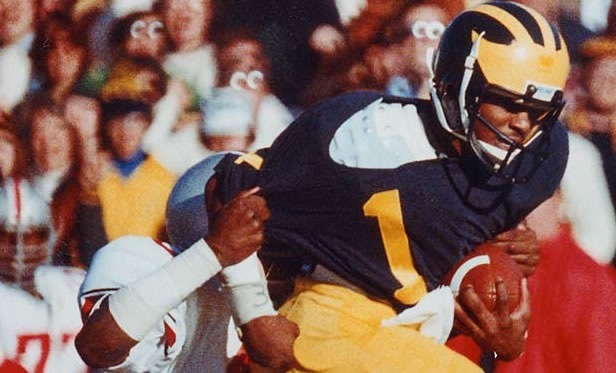 The athletic department began a new way of honoring former Michigan greats. The "Michigan Legend" patch worn on the player's jersey of the number of that Legend. 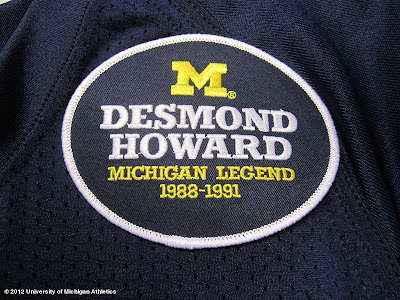 The first player honored, fittingly so, was Desmond Howard, #21...who just happened to be a receiver. It would seem as if the highest honor achievable by a receiver at Michigan is no longer to wear #1, but rather #21. Was this by design? I don't think so, but it seems to be working out that way. Greg at MVictors thinks Roy Roundtree wear #21 this year, and so do we. Here's why. • Yes, Rich Rod is gone but still, I don’t think the athletic department is crazy about Braylon’s comments about the #1 jersey over the past few years and how it’s played out in the media. • They just started the Legends tradition and made a big deal about it in honoring Desmond last season. They will want to keep it rolling to keep it fresh in everyone’s mind. • I’m guessing the athletic department has it on the timeline to honor AC (and maybe Braylon) with the Legends distinction at some point down the road. Couldn't agree more with that last one. It would seem to me that the best way to keep the Legends honor rolling is to keep a receiver in the #21 jersey. Don't let more than a year or so pass without a 21 on the roster. That's what happened with the #1 jersey. Too much time has passed, and now it's turned into this huge thing. But when Brady Hoke was asked on Saturday about the #1 by Frank Beckmann and said "We'll consider it. ", but also noted that all 115 guys are possibilities – that added yet another interesting bit to this drama. Is the #1 jersey up for grabs by any position? Could a QB wear it? Denard?